Do ( 1: Plural noun ) broken long ago forever leave a ( 2: Adjective ) trace? A Vegas cocktail waitress. An Indian herbalist. A British chemistry professor. An Italian-American widow. Four unique women with one thing in common: each is ( 3: Verb, past tense ) by a tragedy from her past. Cynthia, Rohini, Jane, and Angela meet on a food blogging site and bond over ( 4: Plural noun ). They decide on impulse to open The Secret Spice, an elegant café on the magnificent ocean liner, the RMS Queen Mary, currently a floating hotel in ( 5: City ). Rich in history and tales of supernatural occurrences, the ship ( 6: Verb ending in s ) her own desperate secrets. The women are surrounded by ghosts long before they ( 7: Verb ) aboard, but once they do, nothing is quite what it seems. Not the ( 8: Plural noun ) they meet, not their brooding chef’s ( 9: Adjective ) recipes, and not the Queen Mary herself. Yet the ( 10: Plural noun ) they encounter help them discover that there’s always a chance to live, as long as one is alive. 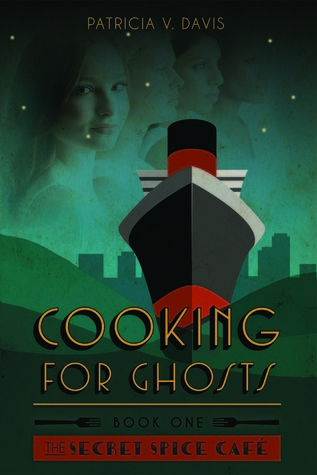 Now that your fun is through, here is the real blurb for Cooking for Ghosts by Patricia V. Davis. This was really fun, I generally put ridiculous answers for any mad lib I do to cheer me up at the end. I just realized it's been weeks since I've done one of these. Now I know why my Mondays have sucked!